We can construct a 3-periodic billiards trajectory in an acute triangle in a classical geometric way, say taking the altitudes. Is there a similar way to construct a 6-periodic billiards? This is basically an amplification of user35593's first comment. Let your triangle be $A,B,C$. Let $A'$ be the reflection of $A$ across $BC$, $C'$ the reflection of $C$ across $A'B$, $B'$ the reflection of $B$ across $A'C'$, $A''$ the reflection of $A'$ across $B'C'$, $C''$ the reflection of $C'$ across $A''B'$. Then it turns out $A'' C''$ is parallel to $AC$. 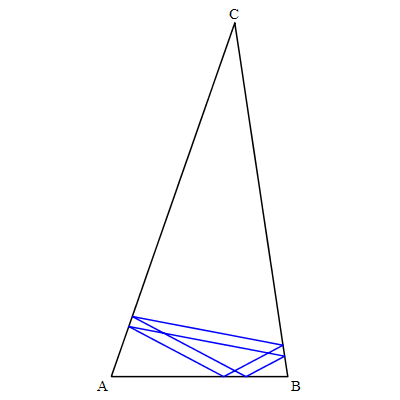 If possible, take a point $p = t A + (1-t) C$ of $AC$, $0 < t < 1$, and $p'' = t A'' + (1-t) C''$, such that the line $p p''$ is contained in the union of triangles $ABC$, $A'BC$, $A'BC'$, $A'B'C'$, $A''B'C'$, $A''B'C''$ (I don't know if this is guaranteed to exist for all acute triangles). Then we get a $6$-periodic trajectory $$p \to (t_1 B + (1-t_1) C) \to (t_2 A + (1-t_2) B) \to (t_3 A + (1-t_3) C) \to (t_4 B + (1-t_4) C) \to (t_5 A + (1-t_5) B) \to p$$ where $t_1 B + (1-t_1) C$, $t_2 A' + (1-t_2) B$, $t_3 A' + (1-t_3) C'$, $t_4 B' + (1-t_4) C'$, $t_5 A'' + (1-t_5) B'$ are on the line $p p''$. Not the answer you're looking for? Browse other questions tagged ds.dynamical-systems plane-geometry billiards or ask your own question. Does the $n$-gonal billiards conjecture follow from the $m$-gonal conjecture when $m>n$? Do identical orbit tiles imply identical combinatorial types? 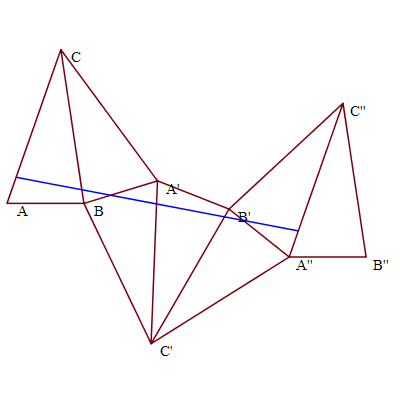 Which polygons have *simple* periodic billiard paths?